Wood, Frank Watson (1862-1953). Watercolour signed and dated 1913. Standard print size: 22 x 11 ins (56 x 28 cms) approx. 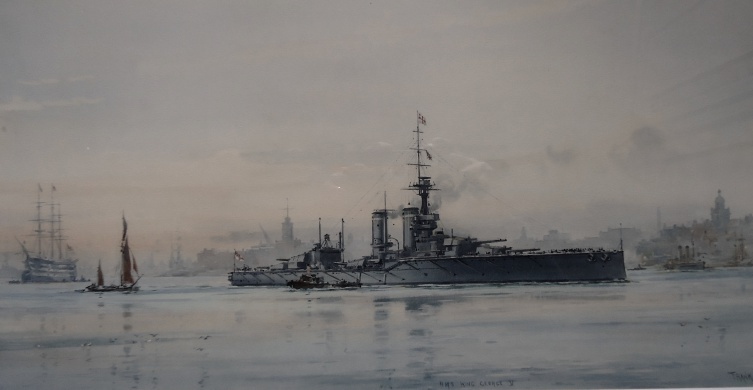 Dated by the artist 1913 this is an early painting of KING GEORGE V (Captain G H Baird RN) for the battleship had only commissioned in November 1912 and after trials and shakedown at sea had become the flagship of the Vice Admiral Commanding Second Battle Squadron, Home Fleet, Vice Admiral Sir George Warrender Bt, KCB KCVO. There were 4 ships of the class, KGV, CENTURION, AUDACIOUS and AJAX; and together with ORION , CONQUEROR, MONARCH and THUNDERER they formed the 2nd BS. The KGVs were the immediate successors of the latter 4 ships but as was the way in those years with dreadnought improvements following hot on the heels of one another, they represented a big improvement on their predecessors. KGV- who despite her deceptively trim shape was, in fact, the largest of the dreadnoughts yet built - is seen here shaping a course down the channel that leads from Portsmouth Naval Base to the Solent and on to the wider reaches of the English Channel. In the background lies Nelson’s famous flagship, HMS VICTORY (Captain R G A W Stapleton-Cotton MVO RN), now, 1913, flagship of Commander-in-Chief Portsmouth, Admiral The Hon Sir Hedworth Meux GCB KCVO.